I listed my Android app "Auto Respond By Text" on GetJar.com and it went active on October 14th. Two days later when I checked at about 5:05 PM it was showing that there were 18 downloads. Now, 16 days later, there have been 55 downloads. I may have contributed to one (if any) of the downloads. Because "Auto Respond By Text" was made using App Inventor for Android, it isn't setup correctly to be able to publish via the Android Marketplace. When I tried to upload it to the Android Marketplace I got an error about the icon. So, as an alternative I have listed it on GetJar.com. I noticed that the apps I was making using App Inventor for Android were ending up being about 4MB in file size. So I decided to find out what size an app is when you use the Android SDK instead. It turns out that there is a considerable difference. A simple Hello World app made using the SDK is only 20KB, whereas one made using App Inventor for Android is 3.55 Mb. I also found out that the startup time for the two Hello World apps differed. On my phone, the app made using the SDK opened maybe 1 1/2 seconds faster than the one made using App Inventor for Android. See below for more details. TinyWebDB is a component in App Inventor for Android that lets your app communicate with a web page in order to set or retrieve values, rather than storing them on the phone itself. I wanted to know what the TinyWebDB component sends to the web page when it tries to set or retrieve values, so I used Kodingen this morning to write a PHP script that takes the form fields and values sent to the page and writes them to a file. So if you write your own PHP page for TinyWebDB to connect to, you can know if TinyWebDB is trying to store a value if the "value" key exists in the $_POST array. If the "value" key doesn't exist in the $_POST array then you know that TinyWebDB is only trying to retrieve the value for the given tag. "Auto Respond By Text" is an Android app I made by using App Inventor for Android. This app is a tool that will send an automatic response to whoever who sends you a text while it is enabled. It was inspired by Google's example app called "No Text While Driving". After seeing that idea, I made mine from scratch and I added much enhancement. Choose from a list of pre-defined responses. Customize your own list of responses. Enable or disable the auto-response feature. Set a timeout so that it will disable itself automatically after a customizable period of time. Thanks goes out to MakeUseOf.com for helping me figure out how to take screenshots of Android apps without having to root the phone. 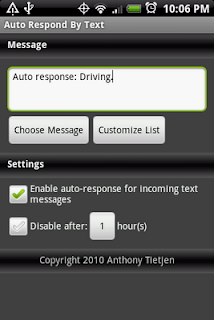 "Auto Respond By Text" is another Android app I made by using App Inventor for Android. This app is a tool that will send an automatic response to whoever who sends you a text while it is enabled. It was inspired by Google's example app called "No Text While Driving". But after seeing that idea, I made mine from scratch and I added much enhancement. I bult a Tic-Tac-Toe game for Android phones tonight using App Inventor. I didn't have to write a single line of code but I was still able to use logic such as whether to show an X or an O based on whose turn it is. I also included a reset button that clears out all the X's and O's when clicked. As I mentioned, I didn't write a single line of code. To build the layout, you just drag and drop components on the visual editor. Then when you want to handle events (such as a button click) you drag and drop events onto the "Block Editor". The Block Editor is also used for creating variables, if statements, etc. The Visual Editor: A website you load in your browser.